I have another great giveaway today! Delovely Details is a new Etsy store with some wonderful products that you are going to love! This husband and wife team have created unique and personal gifts that are great for a wedding, birthday or other special occasion. Here is one of their personalized boxes that would be a great gift for a friend. 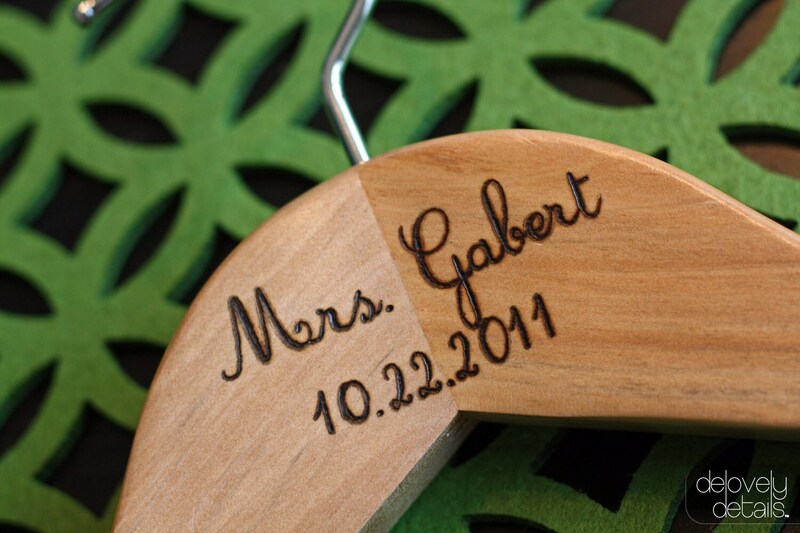 These personalized hangers are great for the bride and are great to use in wedding pictures. Don’t you love these personalized address boxes. 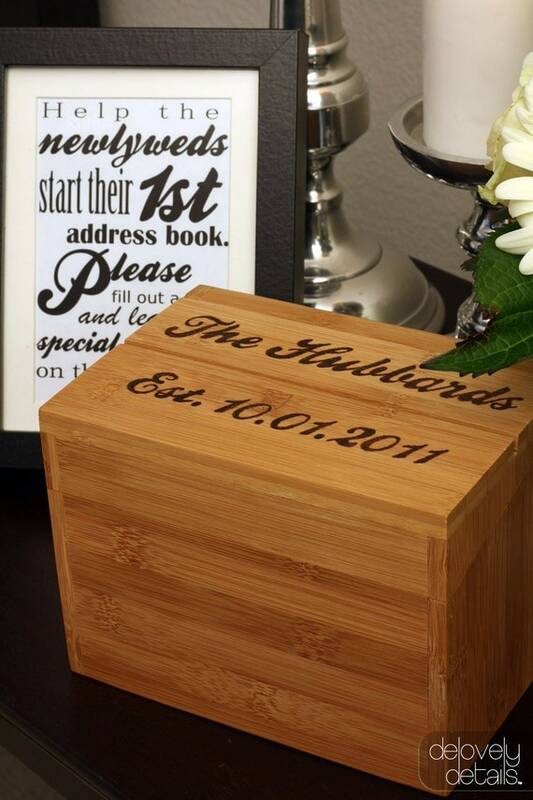 These are great for weddings or a great box to keep momentos from your wedding in! Delovely Details is giving one of our readers a personalized box with 100 personalized address cards along with the PDF file to print more addresses when needed. Visit Delovely Details and leave a comment stating what you would use your box for. 1. Follow Divine Party Concepts on Facebook. 2. Follow Delovely Details on Facebook. 3. 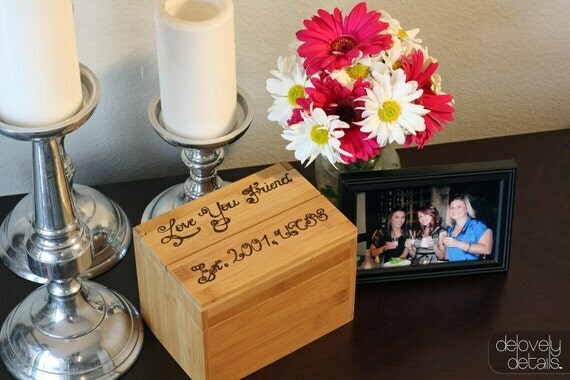 Tweet this: Enter to win a personalized box from @Delovelydetails via @dpartyconcepts! Giveaway ends Thursday, August 25th at midnight. Winner will be chosen randomly and announced the following day. Good luck! I would display the box on my kitchen counter and put recipes in it! I follow them on FB and let them know you sent me! I would use the box to keep wedding mementos like my garter or ring boxes! I know what I would use my box for… my upcoming wedding! What a great idea to have all the guests write their addresses for Thank You’s, and to leave a little note for us to keep for the future. AND I actually already follow Delovely Details. Thanxs for the giveaway! My husband and I are celebrating our one year wedding anniversary in September. He loves to cook, so I would use this box to store all of the recipes we received from our family and friends. I know he would love it! I’d give it to my daughter for her recipe collection! I like you on Facebook and I would put my baby’s first things in it! Thanks for the giveaway! I would use it for cards of businesses I use. I am always losing them. They would be in one perfect place. I would use it at my upcoming wedding next summer. What a great way for guests to leave notes and mementos from the evening. My personalized bridal hanger arrived today. It is a beautiful addition and I am so happy to have it. The box would be a wonderful way to transition all of the time I have spent compiling a wedding invitation list into a permanent Christmas card list! I d use it for my jewelry! how adorable. I think I’d use it to hold notecards or something similar. I often write letters and I always write myself notes to keep track of things. i would use the box to store treasured letters in. I would use it for my recipes.